Disclosure: I received a variety of bars and a $25 gift card for review from Think Thin. All opinions are my own. Can you believe that it's almost summer? It already feels like summer where I live and I am excited about my vacation. In preparation for getting ready for summer, I like to eat smaller meals and snack more often. thinkThin's bars range from high protein that are certified gluten-free to crunch mixed nuts bars made from non-GMO ingredients. 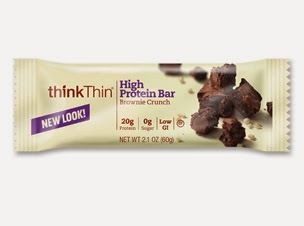 The thinkThin Lean Protein & Fiber bars have only 150 calories so they are the perfect mid-day snack. They are packed full of protein and fiber to give you energy and satisfaction of being full. Even my Hubs who is a gym fanatic, enjoys these bars because of the delicious flavor and protein content. Gluten avoiders rejoice because these new bars are low in sugar and gluten-free. These high-quality bars come in fantastic flavors such as Salted Caramel, Cinnamon Bun White Chocolate (my favorite), Chunky Peanut Butter, Brownie Crunch and more. thinkThin has been recognized by Fitness Magazine with a “Healthy Food Award.” These are the perfect bars to have on hand while you are getting fit for summer as well as tossing into the bag on a flight to the Carribean. No matter what your summer plans are, make sure to include the new thinkThin bars! Connect with Think Thin on Facebook, Twitter and Pinterest. One winner will Receive a Variety of thinkThin bars and $25 Visa Gift Card! i would like to try the chocolate crunch flavor, not sure what i would use the gift card for yet. I want to try the Salted Carmel bar, and I would buy my Dad a birthday present with the gift Card. I'd like to try the Cinnamon Bun White Chocolate. I would use the gift card to treat my husband to lunch. I want to try the Chunky Peanut Butter High Protein Bar and I would buy food with the GC. I would like to try the Divine Dark Chocolate Coconut bar and I would use the card to buy groceries. Thank you. I want to try brownie crunch. I would use the gift card for gas. Chocolate Almond Brownie sounds good! I'd buy coconut or protein bars! I'd like to try the chocolate espresso flavor, and for the gift card we'd put it towards a new blender! I would love to try the CHOCOLATE DIPPED MIXED NUTS CRUNCH BAR. I would buy groceries with the gift card. i like the CHOCOLATE PEANUT BUTTER TOFFEE HIGH PROTEIN + FIBER BAR! and if i won, i would put the visa card in my emergency stash until needed. I wanna try the chocolate almond coconut! It sounds just like my favorite candy bar! With the gift card, it'd go towards a woven wrap for carrying my baby around.... Those things are not cheap! I would like to try the Divine German Chocolate Coconut Bar and I would use the card for gas. The bars I would most like to try are the Chunky Peanut Butter High Protein Bars...yum!...and with the gift card I would take my parents out for lunch one day! I like the Divine Dark Chocolate and coconut bar or the milk chocolate toffee almond protein and fiber bar. I want to try the Brownie Crunch Bar. I would use the gift card towards clothes for my son. I would like to try CHOCOLATE DIPPED MIXED NUTS CRUNCH BAR, would use gift card for groceries. I'd most like to try the Coconut Chocolate Mixed Nuts Crunch Bar and would use this gift card towards groceries. I'd like to try the cranberry apple mixed nut bar. I would love to try thinkThin's Salted Carmel bar, and think I'd use the gift card towards other healthy snacks! I'd like to try the White Chocolate Dipped Mixed Nuts Crunch Bar. I'd put the gc toward a new camera. Brownie crunch for sure. I would put the gift card towards some summer fun! Salted caramel sounds so yummy! And I'd use the gift card toward some new yoga clothes! I would love to try the Salted Carmel bar first. I would use the gift card towards healthy snack items for my son. I would like to try the Chocolate Covered Strawberries Protein Bar first. I would use the gift card to take my mom to lunch. I would like to try the Chunky Peanut Butter High Protien Bar. I'd use the gift card to help my daughter pay for college text books. I want to try the Chocolate Fudge the most. I would put the gc towards some summer tops. I would like to try the Divine Dark Chocolate Coconut Bar. Honestly, I will probably pick up a few items for my son's birthday with the gift card. The Caramel Fudge flavor sounds delicious! CHOCOLATE PEANUT BUTTER TOFFEE HIGH PROTEIN + FIBER BAR, I would use the gift card to stock up on some other healthy foods at the grocery store!! I would like to try the Brownie Crunch. I would save the gift card for a emergency. I would like to try the Chocolate Almond Coconut High Protein High Fiber bar! I would use the giftcard on gas for my car. I want to try the Cinnamon Bun White Chocolate bar! I'd save the GC for our vacation! I would love to try the Brownie Crunch and I would buy Groceries with the GC. I would put the gift card towards some new work out gear. I would like to try the cookies & cream flavor. I want to try the "Chocolate Peanut Butter Toffee High Protein + Fiber Bar" sounds great. I would buy a new sports bra or running shorts with the gift card. I would like to try CHUNKY PEANUT BUTTER HIGH PROTEIN BAR & I would use it towards a new bathing suit for myself! I like to try Crunchy Peanut butter the most.Also I would buy clothes with my gc. Salted Caramel would probably be my favorite! I want to try the Brownie Crunch, and I would use the gift card for some curtains. I'd like to try the CHOCOLATE PEANUT BUTTER TOFFEE HIGH PROTEIN + FIBER BAR. I would probably use the card for gas,. I'd like to try chocolate almond coconut bar. I'd use the giftcard for groceries. I'd love to try the chocolate coconut variety! I would like to try the Brownie Crunch. I would use the gift card for our family vacation. Brownie crunch sounds good. Definitely buy coffee with the visa gc. The Divine Bars look great! So chocolatey! I would purchase some items online to help me with weight management. If I won this giveaway I would love to try the Cinnamon Bun White Chocolate bar! Yum! I think I'd like the Brownie Crunch flavor - and I might use the gift card to buy more bars!! I would try the Carmel fudge protein bar. I'd use the gift card for more yummy and healthy treats. Yum - I'd love to try the Chocolate Dipped Mixed Nuts Crunch Bar. I'd use the gift card for gardening supplies. I would love to try the cookies & cream bar. I would use the GC on dinner out with my hubby. I would like to try the German Chocolate Coconut Divine bar and I would use the GC to get some shorts for the summer. Yum! I would love to try the Divine German Chocolate Coconut. I would use the gift card for groceries. The Brownie crunch looks delicious and my husband would love the German Chocolate Coconut. Chocolate Almond Brownie sounds delish! with the gc I'd probably end up getting something for my 2 little ones. and I would use the GC to buy shoes for my son. I would like to try the Chunky Peanut Butter High Protein Bar and I would buy groceries with this gift cards. I would love the Cinnamon Bun White Chocolate bars. I would buy sunscreen or aloe, still getting summer supplies. Thank you. Cinnamon Bun White Chocolate over here, please! Yum. I would use the gift card to surprise my kids with a day at the trampoline place. The German chocolate coconut sounds amazing! I'd use the card to get my kids some clothes. I would like to try the CINNAMON BUN WHITE CHOCOLATE LEAN PROTEIN & FIBER BAR. I would use the gift card to stock up on some more healthy snacks to help keep me on track. I would love to try the bar! Sounds fabulous! I would love to use the gift card to buy my children some out door items to keep them active over this Summer! A bat and ball, a basketball hoop, maybe a volley ball net! I would like to try the Chunky Peanut Butter High Protein Bar. I would use the card for my granddaughters birthday. I'd like to try the Cinnamon Bun White Chocolate. I would use the gift card to buy some teething supplies for my son. I want to try the salted caramel. I would use the card to purchase more of these bars I think. I would want to try the brownie crunch. I'd put the card towards gas. I would try the chunky peanut butter high protein bar...with the gift card, I may just buy more bars if they taste good. I would love to try the Divine Dark Chocolate Coconut Bar. As far as the visa, it would take care of some summer vacation expenses, maybe a lunch. I would like to try the chocolate dipped mixed nuts!